San Francisco: As Honda introduces, for 2006, a great big pickup truck, it’s probably a good time to take a fresh look at another remarkable truck in the company’s arsenal, the 2005 Honda Pilot SUV. Thanks to the rising price of gasoline, sales of large sport utility vehicles are suffering. Honda’s Pilot may hold on to its sales numbers better than some of its brethren because with this family-size hauler, you can’t even get a thirsty V8 engine. The only available powerplant is a new 255-horsepower V6, working through a five-speed automatic transmission, which has revised fourth and fifth gears this year for better performance. Earning 17 mpg city, 22 highway on the government’s test cycle, the new V6 makes the Pilot the most efficient SUV in its class. You can feel good about its Ultra Low Emissions Vehicle (ULEV-2) status, too. The engine doesn’t need a scheduled tune-up for 105,000 miles. That’s just Honda for you, even in super size. 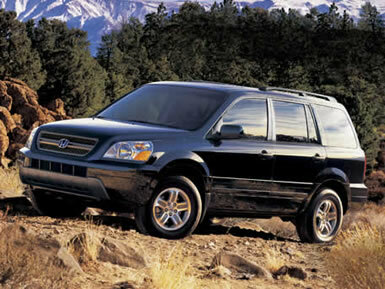 The 2005 Pilot is not much different from the debut 2003 model. Besides the more potent engine, it also receives a “drive by wire” throttle system. An electric wire replaces the old-fashioned throttle cable, and that transmits the accelerator pedal position to the car’s computer. With this arrangement Honda was able to integrate the cruise control function and also make shifting smoother. You can’t really tell as you drive, but it does save weight, always a worthy goal, although the Pilot tips the scale at a beefy 4,400 pounds. Honda appears to have studied American SUVs carefully, coming up with a blocky, chiseled vehicle that looks at home with its numerous competitors while still maintaining a distinctive appearance. It still seems odd sometimes to contemplate the sheer mass of today’s Hondas, but they have done the details right, and the 2005 Pilot is clean and handsome. The Pilot also drives very pleasantly, thanks to Honda’s careful engineering and the fact that they are car builders. Honda trucks tend to drive a lot like giant Accords, which is a good thing. The interior certainly feels comfortable and spacious, in no small part to the nicely sculpted chairs, in the case of my EX-level tester, in gray leather with heating. There is more buttery smooth leather on the steering wheel, which is redesigned for 2005 with sensuous silver accents that incorporate remote controls for the audio system. Honda assumes that we have lots of stuff to carry, because the elaborate console folds out and slides to permit hidden storage of mass quantities, as well as providing firm support of a multitude of beverage containers and a comfy armrest. The Pilot hauls eight people, and plenty of cargo, too. With all seats in their upright positions, there is 16.3 cubic feet of storage, which grows to 48.7 cubic feet with the third row seat folded, and a cavernous 90.3 cubic feet with both the second and third rows folded down. Typically for Honda, there are just two levels to choose from, the well-equipped LX and the upscale EX. The enhancements on the EX include body-colored mirrors and moldings, roof rails, a security system, eight-way power driver’s seat adjustment, automatic climate control, an upgraded audio system with CD changer, heated front seats, and the availability of leather seating, a navigation system, and a DVD entertainment system. Honda made a number of other little changes to the 2005 Pilot, including a new integrated remote key fob, a driver’s footrest, a revised steering pump for better on-center feel, and an improved sunroof with wind deflector in the EX models with leather. For enhanced safety, Honda added a Tire Pressure Monitoring System with location indicator. Under inflated tires are believed to increase the risk of rollovers in tall SUVs. Honda has also included vehicle stability control on the EX models with leather, and all Pilots benefit from a driver seat position sensor and passenger seat weight sensor. These sensors ensure that in the case of a crash, the airbags deploy as safely as possible, and the passenger side airbag won’t go off at all if there is no one sitting there to protect. To see the 2005 Honda Pilot click on www.honda.com or call them at 1-800-999-1009 for more information.